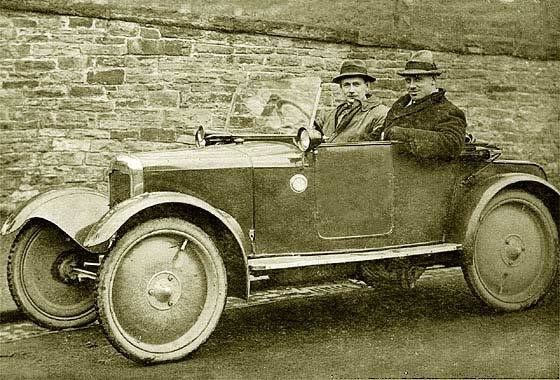 Very interesting photo posted in Rootschat by Jacqueline Cox showing 'pre WW1' cars connected with Will Burgess, and wanted to know make and date. 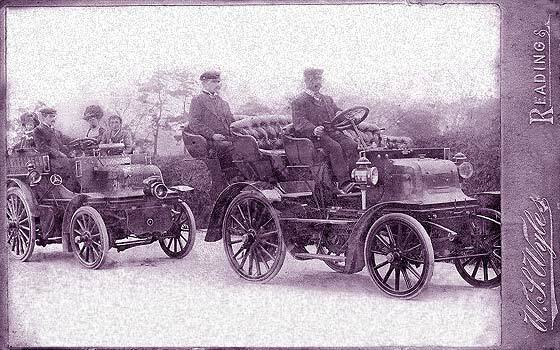 -- Lovely period photo of a couple of Daimlers confirmed by expert Malcolm Jeal as lead car being a 6hp 2-cylinder 'Char-a-banc' and the second car as a 12hp 4-cylinder 'Waggonette'. In Daimler catalogue for 1900. 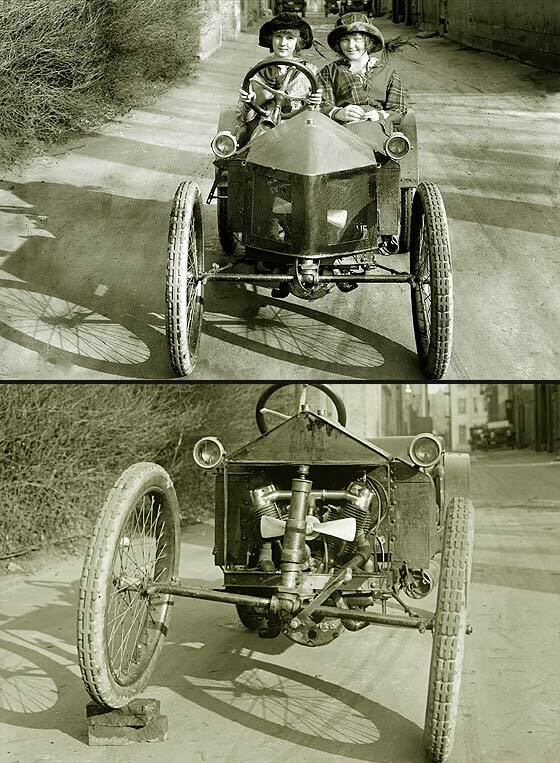 Both vehicles are wheel-steered so cannot be earlier than 1899. As in Reading, perhaps spectators at 1900 Thousand Miles Trial. Number of period photos from Bill Stothard, Cudworth Local History Group (UK) saying he knows that commercial vehicles are not our specialty, but can we help with the identification. -- Yes indeed, commercials are not our specialty and in addition this was a photo-of-a-photo that was very distorted in perspective. This we have straightened. 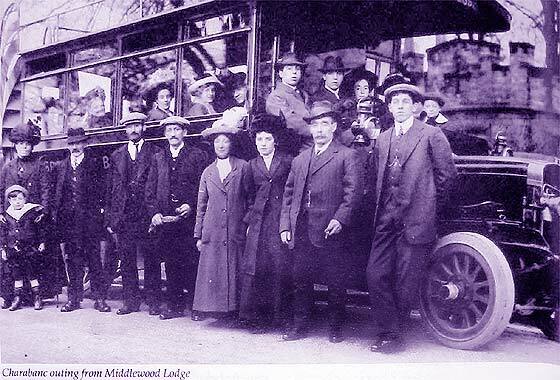 Not much of bus or front is visible so possibly a Commer but we think this is a cca1914 Thornycroft Open-top Double-decker Bus. Another fascinating photograph from our regular contributor Cicos Florin in Constanta by the Black Sea (Romania) who is interested in old cars of Romania. Do we know what this is? -- Although the company started in America during Civil War making munitions, Hotckiss went to France and made cannons and torpedo boats. Started with cars in 1903 copying Mercedes. UK plant in 1914. 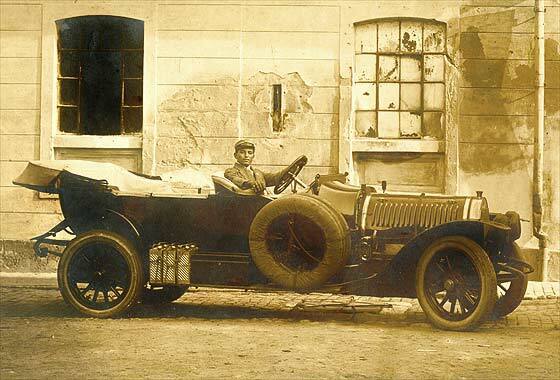 This is a very smart cca 1915 Hotchkiss Double Phaeton, probably AD, against a rubbish background. Surfing through the internet in attempting to identify old vehicles we often come across photographs or old Postcards, including those on Rootschat and those for sale on Ebay, of very interesting ancient machinery which has not yet been identified, so we have a go ! -- Difficult and not a positive identification despite help from AACA. Unusual apertures in the side skirt and sloping louvres. Oval badge on a rounded rad. Closest we have got is a cca 1915 Regal Light Four Touring. Number of period photos from Bill Stothard, Cudworth Local History Group (UK) saying he knows that commercial vehicles are not our specialty, but can we help with the identification. -- Yes indeed, commercials are not our specialty, but what a lovely photo which we have slightly tinted. 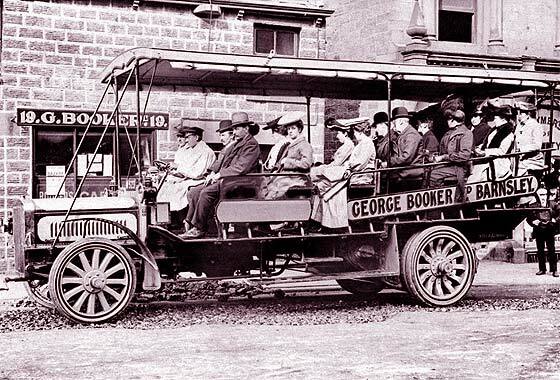 We thought it was a Tilling Stevens but our Ariejan Boss has advised he thinks this is a cca 1907 Durham-Churchill Charabanc made by Hallamshire in Grimesthorpe, Sheffield. Could be! Another very tiny photo from Michael Morrish of Exeter (UK). He says " JUST FOUND THIS PHOTOGRAH. NO HISTORY BUT GOVERNMANT FARM NAIROBI 1914. ???? -- Small photo which we have enlarged. 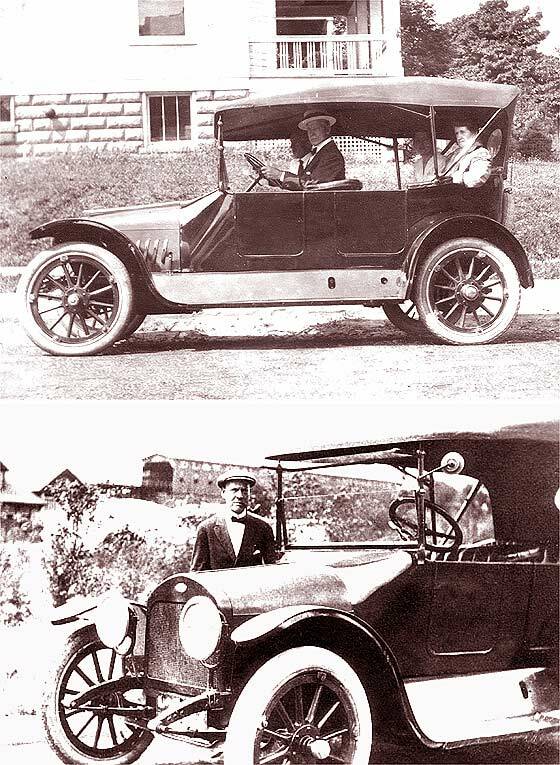 It is of a cca 1910 Ford Model T Five-Passenger Touring Car. Quick look on the internet for Government Farms in Nairobi advises that middle-class retired Army officers were recruited by a government settlement programme after World War 1 to promote agricultural development. Number of period photos from Bill Stothard, Cudworth Local History Group (UK) saying he knows that commercial vehicles are not our specialty, but can we help with the identification. Two could be the same bus. -- Yes indeed, commercials are not our specialty but yes, these appear to be the same cca 1922 Guy Type JA Bus. 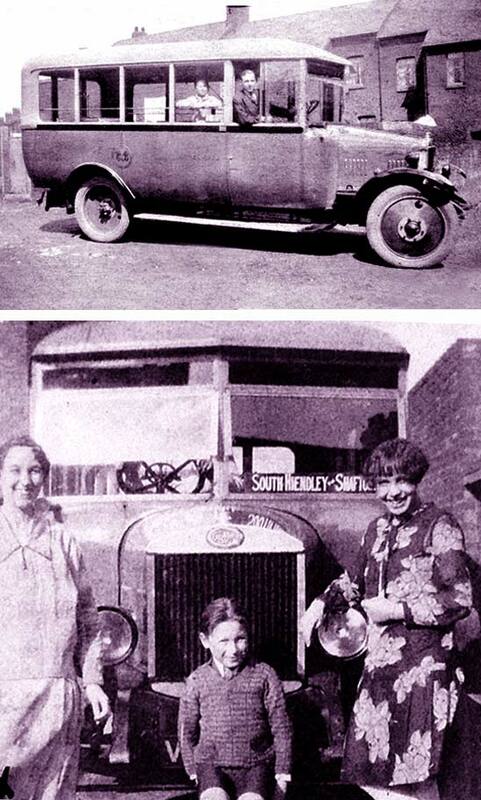 Sydney Guy, ex works manager Sunbeam, founded Guy Motors in Wolverhapton in 1914 making commercial vehicles and became one of UK's biggest. Also cars. Another fascinating photograph from our regular contributor Cicos Florin in Constanta by the Black Sea (Romania) who is interested in old cars of Romania. Do we know what this is? -- Unfortunately a stain on the photo over the top of the radiator and badge which made it difficult to identify because the coachwork/wings are bespoke, and there are great similarities between a Hispano Suiza and Delage, but we are leaning towards this being a cca 1923 Delage D1 Skiff Boattail Tourer. Surfing through the internet in attempting to identify old vehicles we often come across photographs or old Postcards, including those for sale on Ebay, of very interesting ancient machinery which has not yet been identified, so we have a go ! -- This shows a rather nice British air cooled twin cylinder engined car built in Coventry by the company who in 1885 introduced thecurrent shape Rover Safety Bicycle. Motorcycles 1902, cars 1903. This is cca 1923 Rover Eight Two-Seater MK2 1919-25. Another fascinating photograph from our regular contributor Cicos Florin in Constanta by the Black Sea (Romania) who is interested in old cars of Romania. Do we know what this is? 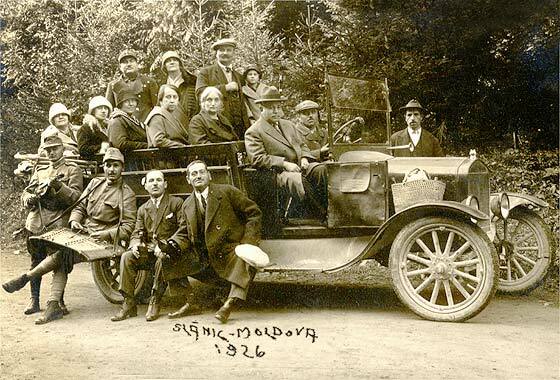 -- American car in spa resort town of Slanic-Moldova on the slope of the Eastern Carpathians by river Slanic. The vehicle is a cca 1923 Ford Model TT Light Delivery Truck, unusual in having no cab or roof cover for driver so perhaps an 'Open Express' or 'Charabanc, or may perhaps be home/locally made. Another fascinating photograph from our regular contributor Cicos Florin in Constanta by the Black Sea (Romania) who is interested in old cars of Romania. Do we know what this is? -- A couple of our experts agree it is a Willys-Knight. I thought cca 1928 but our Mark Dawber says he would go for it being a 1925 or 1926, Model 70 Tourer, because it looks to have 6.00 x 20 tyres. The 56 has a 109" wheelbase, 70 is 113. Willys became famous for MB 4x4 Utility (JEEP). Became Keiser 1952. Cinema screen grab taken from a Czechoslovak film 'Vysokka zed' (The High Wall) made in 1964, where cars are being investigated by IMCDB. Story of a very young girl's relations with a paralyzed young man who slowly starts recovering and her tantrum on discovery of his fiancée. 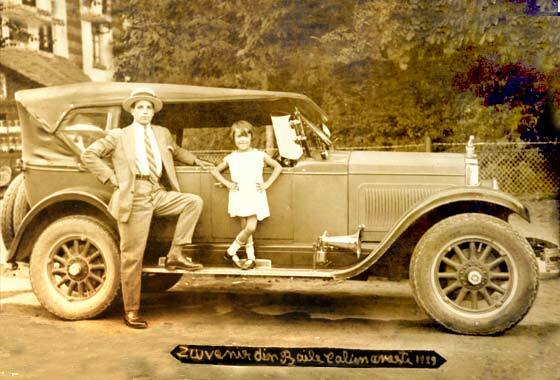 -- Upright windscreen, vertically split drivers window, headlamps that seem to come from the bonnet only, electric indicators etc, so is likely a cca 1927 Tatra 11 probably a two door saloon, or taxi . Another fascinating photograph from our regular contributor Cicos Florin in Constanta by the Black Sea (Romania) who is interested in old cars of Romania. Do we know what this is? 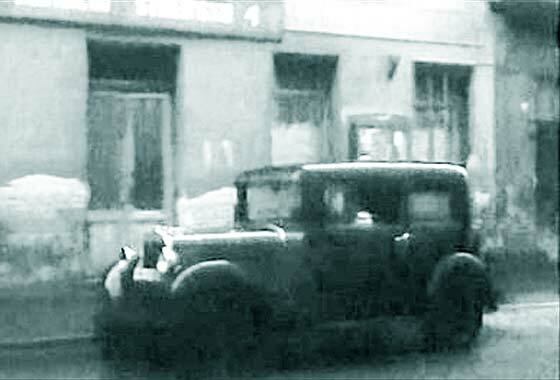 -- Our Mark Dawber advises it is a cca 1927 Erskine Model 50W sedan. The front bumper looks to be aftermarket as generally bumpers were not factory fitted as standard. The headlights are unusual as many cars still had drums. 1927 was the only year Erskine had door handles below the belt line. 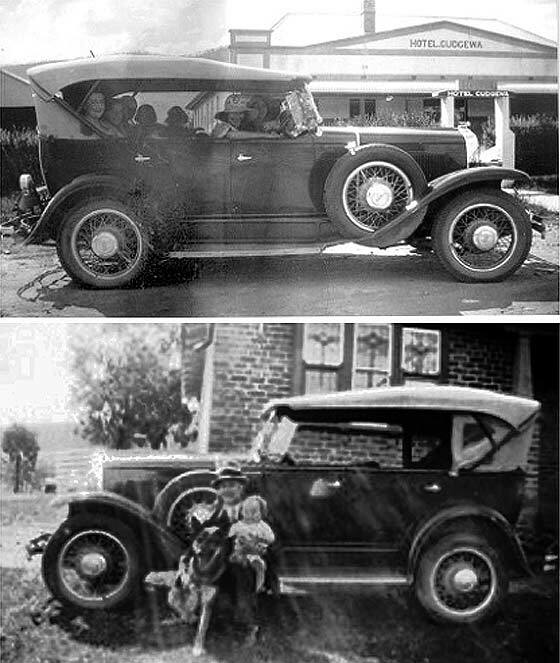 Number of period photos received from Duncan Ray (Australia) with a request for our help in dating and naming some cars that were in old negatives from the 1930s which may help in dating old photos he has printed from negatives. Taken in north eastern Victoria of his Aunt and her husband and others (?). Great website. 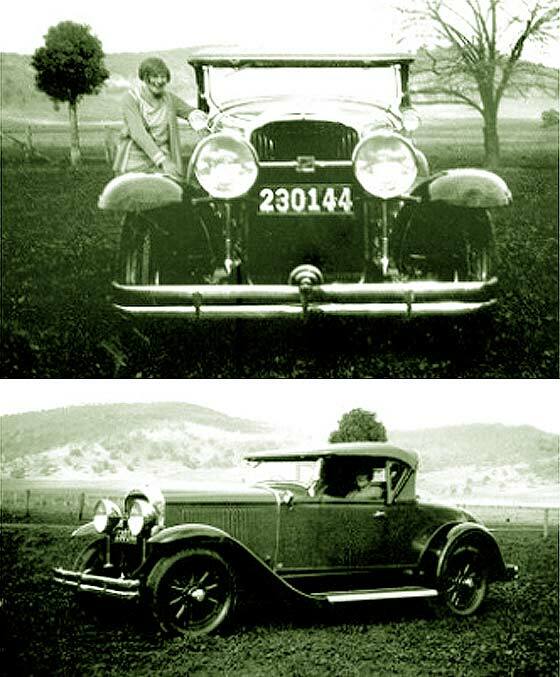 -- Bit delayed in responding due absence overseas so our Mark Dawber helped by investigating and advising it is a USA cca 1930 Buick Series 40 Sport Roadster (Model 44). 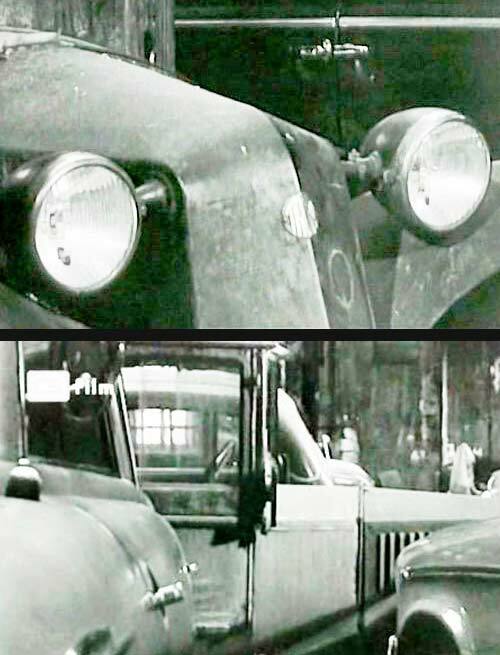 Cinema screen grab taken from a Czechoslovak film 'Vanoce s Alzbetou' (Christmas with Elisabeth) made in 1968, where cars are being investigated by IMCDB. Story of difficulties in adjustment between lonely old men and lonely teenage girls. -- Although slightly looking like an American vehicle, this car was made in Mlada Boleslav in Czechoslovakia. It also seems to carry an American name popularised by Ford. This is cca 1931 Skoda 422 Two-Door Saloon called the 'Tudor'. Number of period photos received from Duncan Ray (Australia) with a request for our help in dating and naming some cars that were in old negatives from the 1930s which may help in dating old photos he has printed from negatives. Taken in north eastern Victoria of his Aunt and her husband and others (?). Great website. 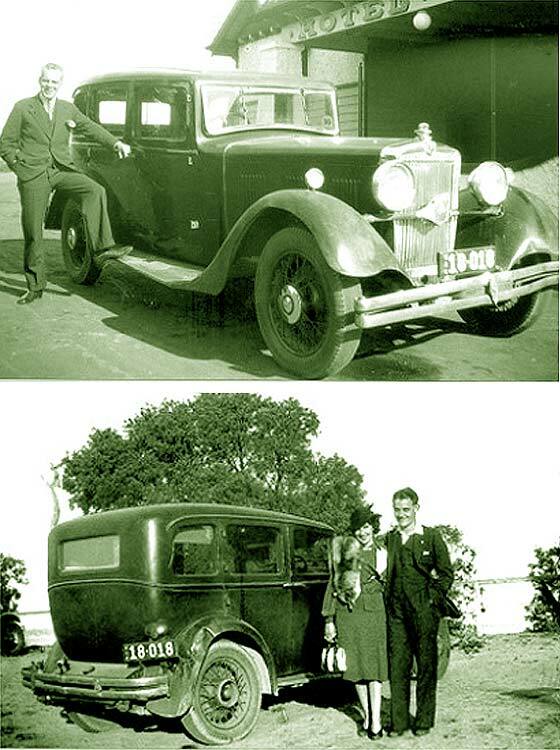 -- Our Mark Dawber helped by advising this is an American 1931 Chevrolet, with a Holden body, photographed in Oz in front of Hotel Cudgewa, which is still there today. Number of period photos received from Duncan Ray (Australia) with a request for our help in dating and naming some cars that were in old negatives from the 1930s which may help in dating old photos he has printed from negatives. Taken in north eastern Victoria of his Aunt and her husband and others (?). Great website. -- Distinct horn housing and three sets of louvres so this is a British cca 1932 Morris Isis Saloon with American appearance, because they were fitted with Budd steel body. Another Photo received from Simon Powell (Caymen Islands) who lived with parents in Cheadle Hulme, Manchester. 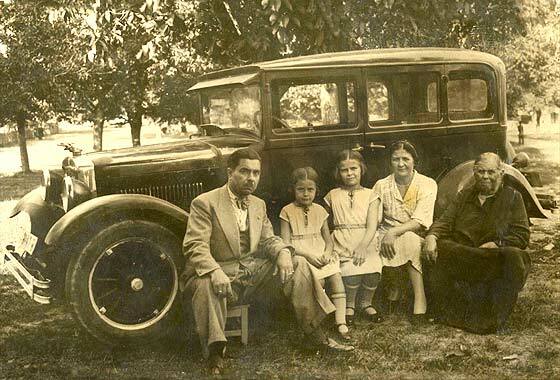 This car was belived rented/borrowed by by visiting relatives and taken in late 1955/early 1956. -- Registration BXU was issued by the London County Council in May 1935. 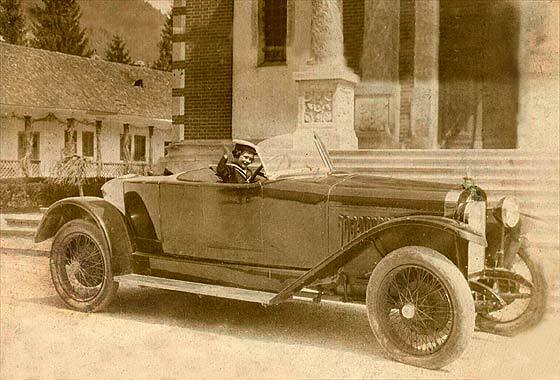 The car has a rather rakish look about itself and has five sets of louvres along the bonnet. This is rather nice cca 1935 Rover 14HP P1 Sportsman Saloon. Rover 14s were made 1933/1940 and 1945/1948. 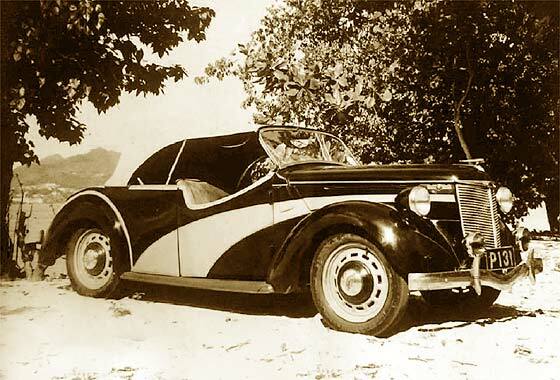 Another from Michael Morrish of Exeter (UK) of car belonging to Captain Desmond Phayre of Chagford in Devon, this while based in Lahore Pakistan. It is a negative, it is very small and it is very pixly. Nothing like making it difficult for us. We really need scans of BEST RESOLUTION possible (high dpi), as it is the detail that provides the identification. -- Notwithstanding, we can advise it is a 1936 Plymouth P2 Four Door Sedan, if via UK, then possibly badged Chrysler Wimbledon Six Airglide. 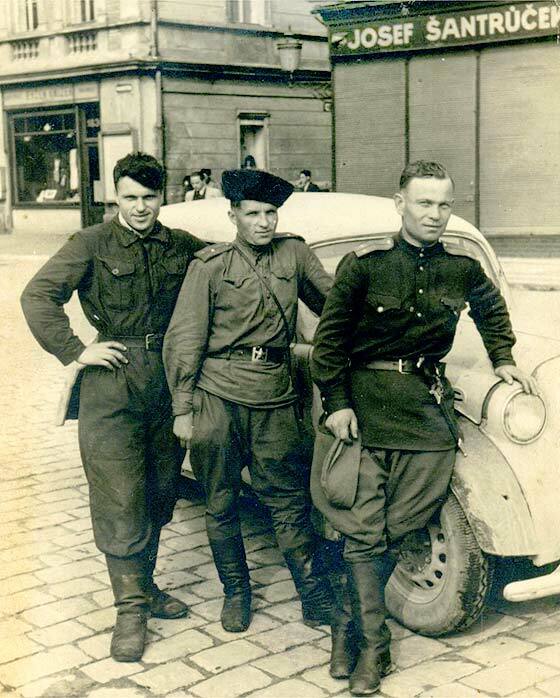 Another interesting photo sent to us by Andrew Kostin from Moscow (Russia) who is a collector of old photos. Can we identify this photo of a captured German vehicle taken in April 1945 in the liberated Czech city of Nymburk. 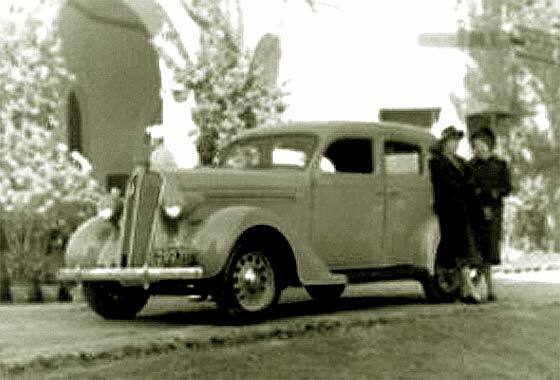 -- If captured in Germany then it is a cca 1937 Opel Kadett K38 Saloon. Practically identical car was later made in the USSR from 1946 chosen by Stalin using 'war reparations tooling' from Rüsselsheim as 1,074 cc Moskvich 400 / 420 and remained in production until 1956. 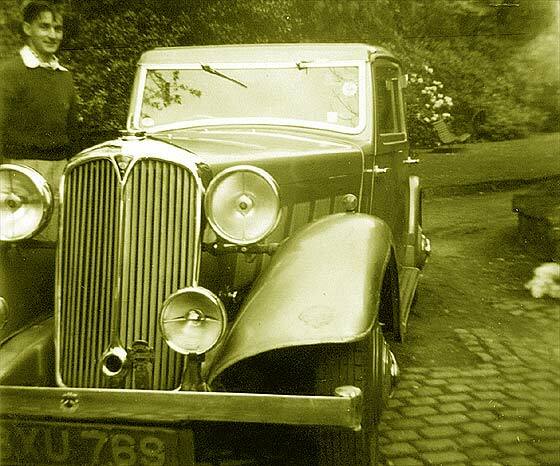 Fascinating photo received from Darryl Brathwaite (UK) asking if we could identify car from an old family photo. There were only 2 examples on the Island of Grenada, British West Indies, in the 1950's. -- Our Tony Russell advises this is a circa 1949 Ford Prefect E93a 'bitsa'. Probably a rare Four-seat Touring Car, export model. The windscreen is from a saloon. The doors are certainly from a tourer. Non standard hood and the rear body may have been a conversion from a two door saloon. 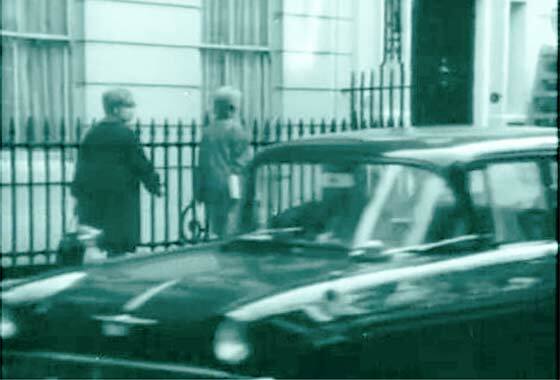 Cinema screen grab taken from an Italian made for TV mini series 'Melissa' made in 1966, where cars are being investigated by IMCDB. The story is apparently set in London so it contains many British Vehicles. -- This screengrab shows an interesting motorcycle which was quite uniquely modern for its day and yet made by one UK's oldest makers. This is a cca 1960 Ariel Leader Motorcycle. Fully enclosed, monocoque, integral windscreen, flashing indicators, 250cc two-stroke. 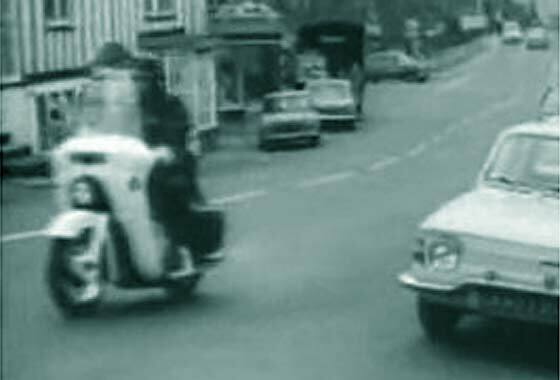 Cinema screen grab taken from an Italian made for TV mini series 'Melissa' made in 1966, where cars are being investigated by IMCDB. The story is apparently set in London so it contains many British Vehicles. -- This screengrab shows an interesting British General Motors car a cca1960 Vauxhall Victor Saloon uniquely modern for its day with heavily curved windscreen and rear window, screen pillars sloped backwards. The bodywork was derived from the 1957 Chevrolet Bel Air. Lovely photo submitted by Anikka Fuchs (Germany) who is rapidly becoming keen on old cars via her boyfriend. Currently working in France, she snapped this interesting car on the streets Hamburg. What is it? 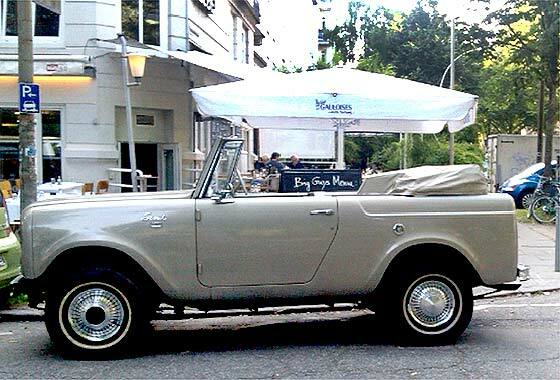 -- Very unusual relatively modern car identified by our Daniel as an American cca 1966 International Harvester Scout 800 Sportop Convertible. International Harvester is better known for their tractors. Scout 4 x 4 was designed in the fifties. 500,000 were made 1961-1980. 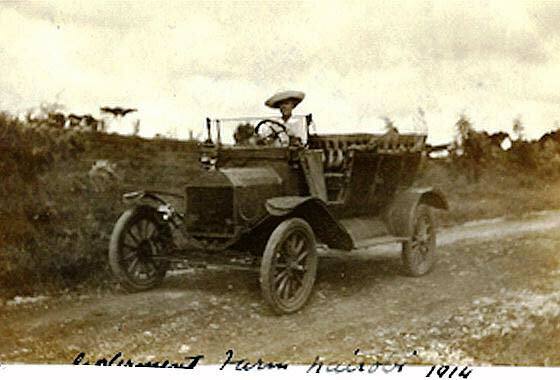 Fascinating link sent to us by Mark Dawber (New Zealand) to a photo of a light car tagged as 'Early Car, England' on a NZ history site. -- We have contacted a number of our wise sages and have general agreement that neither car nor background is UK. This photo is on a number of websites including one with the bonnet off revealing a Spacke De Luxe V Twin engine used by many cyclecars in USA 1910/1920. Unique steering mechanism should have prrovided make but nobody has found it so far.